For many crafters, that molten embossing powder in shades of gold and silver were the first thing that got us hooked. In the last few years, we have found other ways to get that kind of metal effect and foil techniques have become really popular (again) be it with sticky embossing powders or hot/cold lamination. Wanda is here to share her insights, tips and tricks. Hi everyone, it's Wanda (Art By Wanda Blog) with you today, and I'd like to share with you a few different ways to add foil to your projects. I love using foil!!! Oh, the joy of seeing that shine on a project!! And it's a wonderful contrast to the matte look of the Fresco Finish Paints. There are many ways to use foil - even more than I am sharing today. I'll cover the basics of each way here but you can find many more pictures and detailed information of the projects on my blog. The foil I am using is the kind that comes on a release sheet. The front is the shiny, colored side and this is the side to have up when you are working, placing the back side down onto what you want it to stick to. Always remember this!! Stamps and Stencils used for these projects are all Lin Brown designs - ELB10, ELB11, ELB12, ELB29 and stencils PS005, PS044. 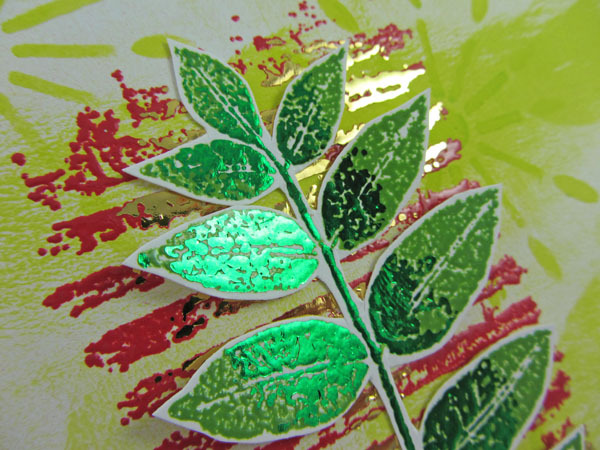 One way to add foil is with warm, melted embossing powder. 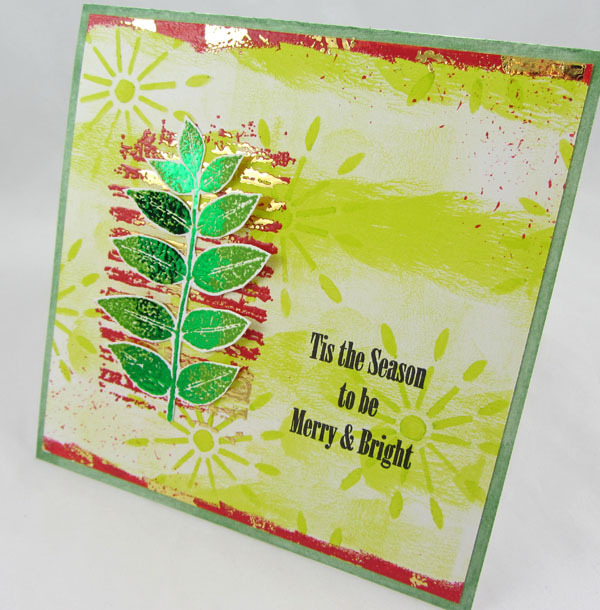 I stamp and emboss my image then go back and rewarm the melted embossing powder where I want to add foil. You need to have your foil ready to press onto the warmed embossing before it cools as the foil only sticks when the powder is warm. After pressing on the foil (shiny, colored side up) you then peel the sheet off. For the leaf I just reheated along the center area so the leaves are two-toned with the Fern Green Powder and Green Foil. On the Red Geranium Embossing Powder I went for a somewhat random look. When trying to accomplish this, it can be helpful not to press to hard. ... you can also use the laminator to add foil to gloss gel medium. I used Golden's Heavy Gel Gloss to stencil, allowed it to dry completely and then ran it through the laminator with red foil. I had done this before always smoothing the gel but decided to try and leave the gel more dimensional and uneven for this. That is the image on the left. It worked but definitely gave a more distressed look to the foiling as there are some spots the foil didn't stick (too much difference between the high and low spots) and also some extra spots that got some gel on them while removing the stencil. I did it again smoothing the gel (the image on the right) and you get a more elegant look. I think both a fabulous!!! Here I'm peeling the sheet off the first one after running it through the lamintor. 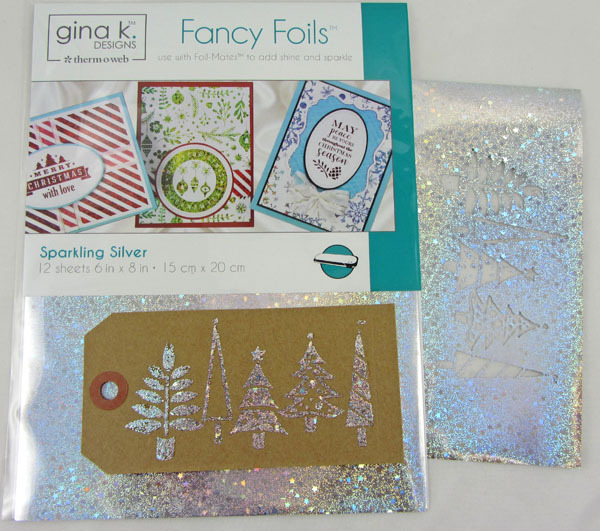 You can also use double sided tape to add foil. Stick the tape to your project, peel off the liner, press the foil onto the tape, peel back. Double sided tape comes in many widths and you could even put wide tape onto cardstock, die cut it, and then add foil to the top. 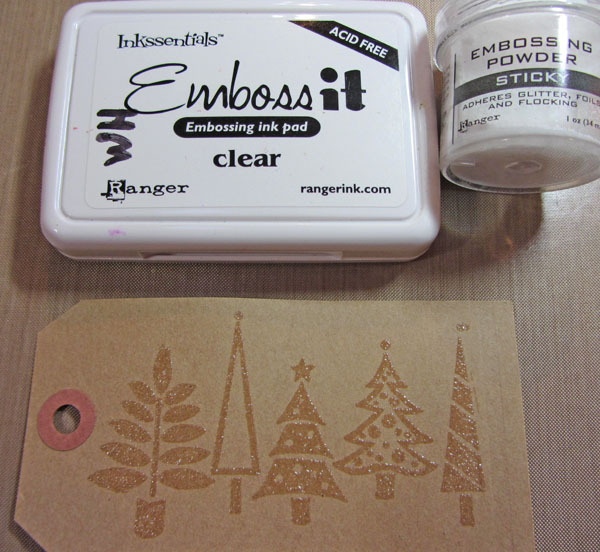 Finally you can use Sticky Embossing Powder. The advantage to using sticky powder over regular powder is you have more work time and it's easier to foil a large, complete image. Sticky powder works exactly the same way as regular embossing powder except that it leaves the image sticky. You stamp your image, pour on the powder, tap off the excess powder and then heat to melt. When you melt the powder it's important to only heat until it turns clear and then move on. If you heat it too much it will dry out the adhesive and it won't be sticky. Once it's sticky, don't touch it!!... 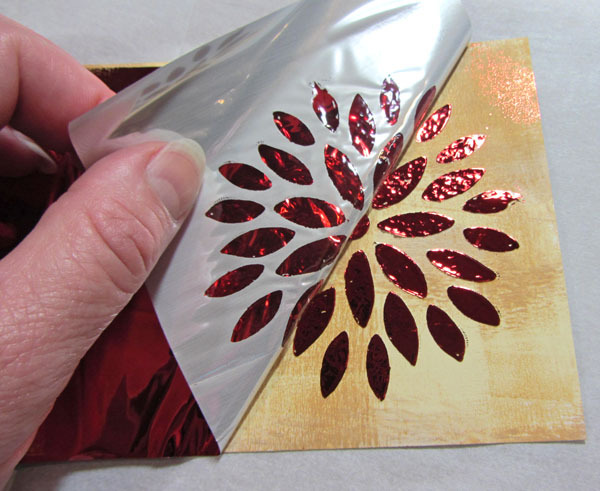 apply the foil pressing well over the image and peel off the release sheet. If there are any spots left without foil just press foil again in that spot to fill in. 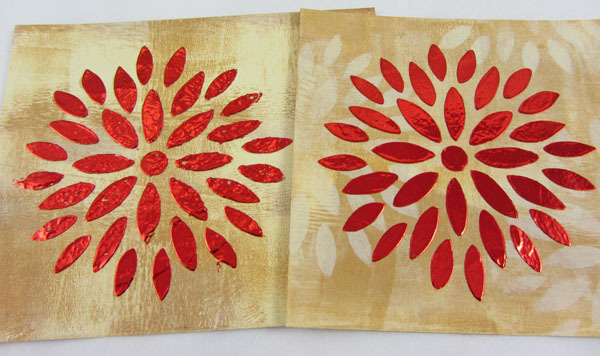 If you've never used foil, I do hope you are inspired to try adding foil to your projects. 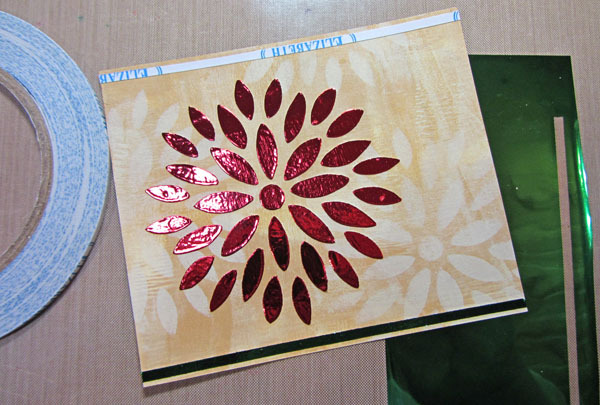 If you like drawing your own images, try making a laser copy and then foiling using a laminator. How cool would that be!!!! Foil is available from several companies and although I haven't tried them all, any should work fine. OK fess up, who knew the gel trick?? What a great idea! These ideas are all wonderful for Xmas , and of course foil laminating is perfect on any Christmas card - we're all going to look super professional this Christmas!!! 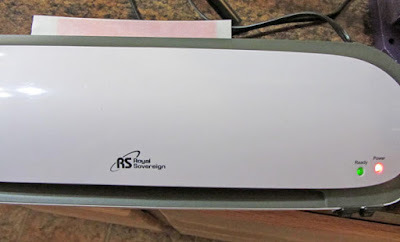 Love foiling and have always wanted to buy a new laminator to play. That green on the leaves is amazing. Your projects just glow and are beautiful! wow, pretty pretty! so many possibilities. This is my kind of Christmas card! I love the colours and the contemporary style. If only I had a laser printer... and/or a laminator! Mind you I tried foils with a clothes iron once (moderately successful...). Love your makes Wenda, bright, beautiful and shiny! Such an informative post Wanda! There are so many good ideas here. 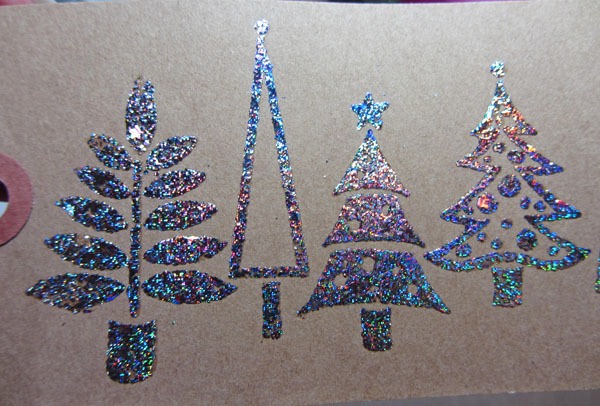 I love the metallic foil trees! I love your foiling - it's something that I have always wanted to try - and this makes me want to try it more!